Strategic, compelling stories can raise awareness, change attitudes, and motivate people to take action. While communications professionals understand the power of storytelling, many nonprofits lack the expertise or capacity to take full advantage of its motivational power. The Rockefeller Foundation recognized that many nonprofits struggle to integrate storytelling into their communications strategies, and sought to elevate the practice. The Hattaway team used interviews and workshops with thought leaders in digital technology, social media, entertainment, journalism and other fields to analyze the storytelling landscape in the nonprofit sector. Storytelling is a powerful tool—but many nonprofits lacked the resources to take advantage. Our analysis revealed that nonprofits needed guidance in thinking through their storytelling strategies, creating compelling content, using social media, and evaluating their campaigns. Based on these findings, we partnered with the digital strategists and designers to build a storytelling platform called Storytelling for Good. Storytelling for Good acts as a concierge, connecting organizations of all sizes to a suite of tools and a growing community of storytellers working to improve lives around the world. The platform helps thousands of nonprofits lay the foundation for strategic storytelling, craft compelling content, choose the best tools to engage their audiences, and measure the impact of their work. Digital tools and training programs help nonprofits around the world tell powerful stories that motivate people to support their cause. Along with the digital tools, our team customizes training programs that help nonprofits around the world leverage the power of narrative and networks to expand their reach, resources and impact. We’ve conducted trainings in Bangkok, Delhi, Washington, D.C., New York and Nairobi to introduce storytelling tools and techniques, empowering program staff to craft powerful stories that build support for their unique causes. Many nonprofits are not equipped with the expertise or experience to create strategic, compelling stories. 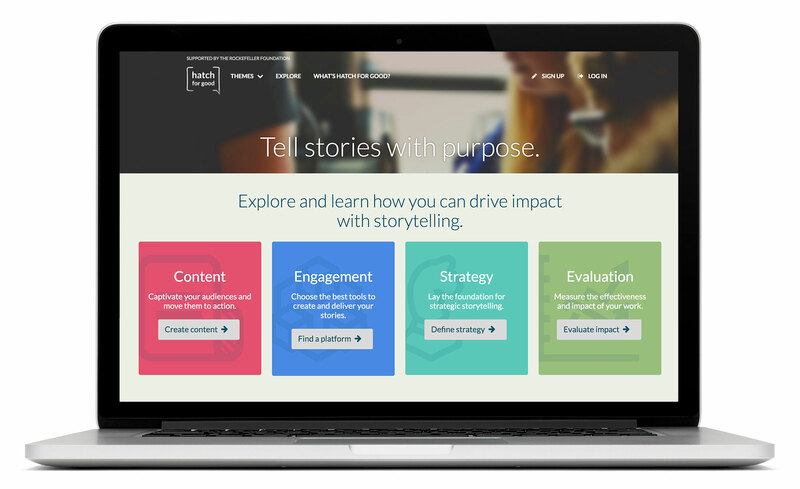 Storytelling for Good is a digital platform and training program that provides toolkits, case studies and strategic guidance to help nonprofits tell stories with purpose. The Social Impact Story Map—a feature of the platform shown here—helps users craft stories that capture people’s imagination, inspiring and engaging them in the cause.